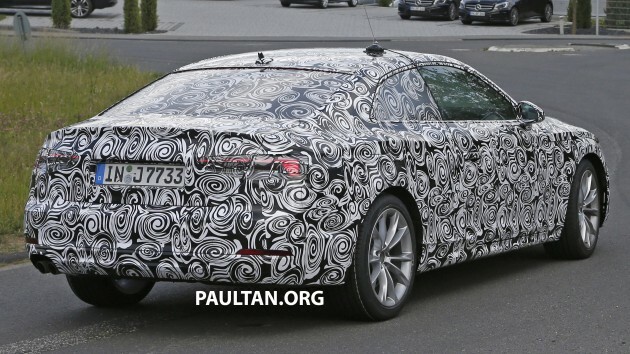 Here we have the first spyshots of the new second-generation 2017 Audi A5 – our European spy photographers scooped the upcoming A4-based coupé as it was driving through the back roads of Germany. Even with the amount of camouflage on board, it’s clear that the new car will feature an evolution of the current car‘s styling, while still setting itself apart from the A4. The headlights look set to keep their rectangular shape – rather than adopting the A4’s C-shaped units – while the characteristic side profile, window shape and undulating swage line also looks to have been retained. Even the tail lights look to have been unchanged, save for new boomerang-shaped graphics. Built on a development of the MLB platform – dubbed MLB Evo, first used on the new Q7 – the A5, like the A4, is set to utilise ultra high-strength steel, aluminium and composite materials, with hopes of cutting up to 100 kg from the current car’s weight. As the A5 is bound to share a lot of components with the A4, we should expect it to gain a similar suspension setup, too – five-link front suspension and self-tracking trapezoidal-link rear suspension. Under the bonnet, an all-new 2.0 litre TFSI petrol engine should sit alongside a range of TDI diesel and petrol mills, mated to either six-speed manual or seven-speed S tronic dual-clutch transmissions and a choice of front- or four-wheel drive. 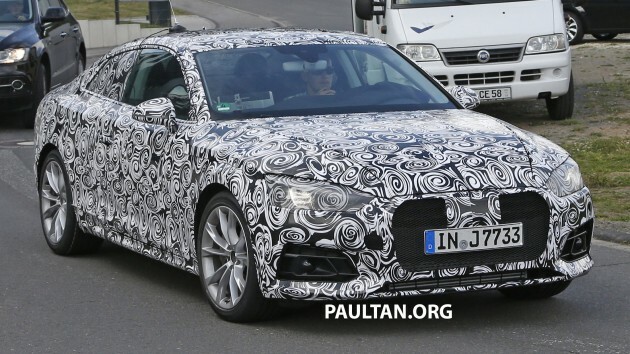 While no information of upcoming variants are available just yet, the popular five-door Sportback body style is likely a safe bet to tackle the BMW 4 Series Gran Coupe. Hotter S and RS models are almost definitely on the cards as well. UNREGISTER,Audi A5 2.0 TFSI Quattro S Line 4-DOOR JAPAN SPEC,CRAZY PRICE DONT MISS OUT!!! I’m expecting some “glorified VW” kind of comments. Even with the camo, it has a nice stance and looks good.